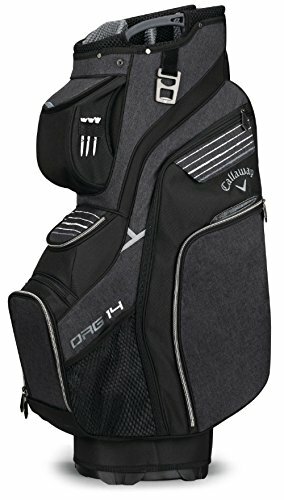 The Org 14 is Callaway's best-selling cart bag. As the name suggests, the bag leads the industry for easy organization with a 14-way top with individual full length dividers and 12 pockets for all of your storage needs. All pockets are forward facing as to be easily accessible on the cart and have a purpose in mind. It features a magnetic pocket for the range finder, dual magnetic valuables pockets for easy access, two large insulated cooler pockets with drain ports. All of these great features are wrapped with a heather woven fabric to give the bag a style of its own.